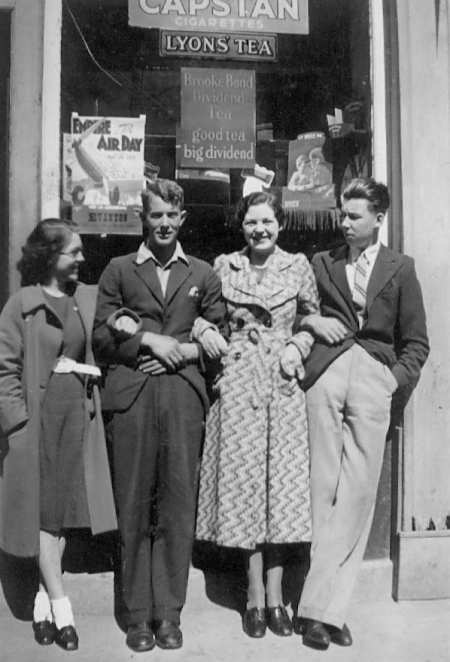 Nancy is on the left, with George on the right, but who are the couple in the middle, and which shop is it? The sign on the left says 'Empire Air Day' in Evanton. The man next to Nancy I am almost positive is Victor Urquhart of Bank Street, but definately one of the Urquhart brothers. Victor was killed in France about 1944. The other woman could be Connie Summers. Don't know the shop. The people in the picture are as follows from left :- Nancy Skinner, Victor Urquhart, Hetty McGregor, George Eastwood. Standing out side McGregor's shop. Hetty McGregor's parents ran the shop. The father was known as 'Tunny'. He had been the grieve at Newton farm before buying the shop. I remember that when my sister and I were wee, in around 1966 or 1967 Hetty, who must have been either reclusive or infirm, used to throw thruppeny bits out of the upstairs window to passing kids to spend in the shop. The MacGregors moved from Cromarty in the late 60s. Someone told me they'd moved to Tain, but I'm not sure this is correct. Anyone know? My American dentist is well off because of Tunney's shop. As a young teen I had an affection for Highland Toffee and was nicknamed "Coo Candy." I don't think it was a term of endearment. But, thanks to my American dentist, I have most of my own teeth, apart from one of my front teeth which was broken when I fell onto the beach in front of the Royal in 1966. Now I know who anon is!! Hello my friend!